New York City cartoonist and film director Dan Meth has put together a montage of films featuring the World Trade Center Twin Towers. 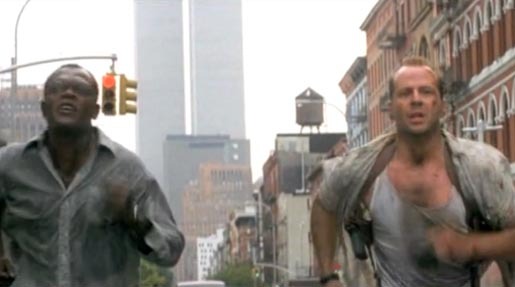 From 1969 to 2001, the Twin Towers made countless cameos in Hollywood films. Sometimes featured prominently in the foreground, sometimes lurking in the distance. This montage celebrates the towers’ all-too-short film career with songs that capture the passing decades. Music is “Like an Eagle” by Dennis Parker, “Once in a Lifetime”, by Talking Heads, and “Juicy/New York, New York”, by Notorious Big/Frank Sinatra Mashup – DJ Cappel and Smitty.